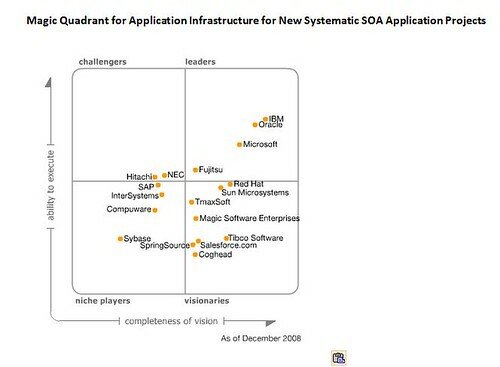 Microsoft has been positioned in the Leaders Quadrant of all three Gartner Application Infrastructure Magic Quadrants. 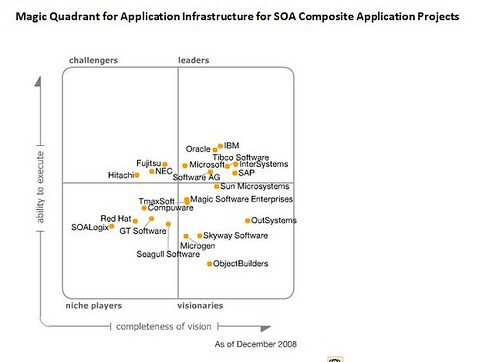 The Magic Quadrant for Application Infrastructure for SOA Composite Application Projects , Magic Quadrant for Application Infrastructure for New Systematic SOA Application Projects, and the Magic Quadrant for Application Infrastructure for Back-End Application Integration Projects. In Microsoft’s opinion, placement in the Leaders Quadrant validates that Microsoft is delivering a leading edge platform for service orientation and integration. According to the Gartner Magic Quadrant for Application Infrastructure for Back-End Integration Projects, “Leaders are vendors with a proven and comprehensive integrated product set, as well as a sizeable installed base of reasonably satisfied clients that extends internationally. They have an ample installed base of products to cross-sell their integration solutions to, and have demonstrated their ability to anticipate technology and market trends over the years by extending their offerings with composite, application-enabling technology. 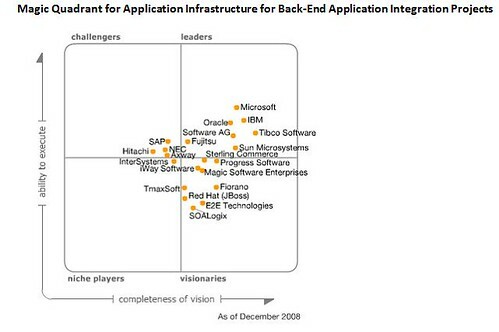 Leaders manifest their understanding of the problem space by providing innovative features, and by extending their integration technology to support initiatives, such as SOA and BPM.” The Magic Quadrant, an esteemed evaluative model established by Gartner, positions vendors according to their ability to execute and completeness of vision across current and future technologies. For more information on today’s news, please click here for details on the press release, and here to read more on Steven Martin’s blog. The Magic Quadrant graphic was published by Gartner, Inc., as part of a larger research note and should be evaluated in the context of the entire report. The Gartner report is available upon request from Microsoft Corporation.